Week 2 of Project 52: Date Nights has all ready brought upon challenges. The original plan was to roast marshmallows outside in Nathan’s new fire pit from Christmas. Then it snowed the night before our date night. And the 17 degrees temperature didn’t melt the snow in time. Way too cold. Lesson #1: Blame the weather. Then I thought of borrowing the Super Mario Brothers game from our neighbor and playing it on the Wii. Yes, this is the same neighbor who makes the kids do push ups for candy on Halloween. He is the best neighbor ever. And I mean that sincerely. He offered to let us borrow the game because it is so awesome. Except he was going to play the game that same night as our date night with his girlfriend. Dang. Lesson #2: Blame the neighbor. So… the day of our date I still had nothing. I dug deep into my creative mind and came up with a simple game. A game that Nathan and I have both been afraid to try. A game that all of you, I’m sure, have heard of but called by many names. In our case, I’m calling it First Words. It’s where someone say a word and the second person say the first thing that comes to mind. Nathan and I have avoid playing First Words because we are not good at thinking off the top of our heads under pressure. After the kids went to bed, Nathan and I cut out the game cards I made. Then we warmed up some apple pie and had date night in our room. We love it so much that we decided to hang out there for the night. The game didn’t turn out too bad despite our nervousness trying something new. We had a great time laughing and discussing our answers and why we thought of whatever it was that came to mind. Lesson #3: Trying something new together makes it easier to do. Nathan said: This was a fun and simple date night. It was especially nice to relax and enjoy our newly finished bedroom. The word game led to a fun conversation about past experiences and memories related to certain words. We laughed and talked and had some time to ourselves without any distractions. Want to play the game for your date night? I conveniently made this PDF print out of the First Words game cards for you. These are the cards we used. Have fun and tell me about your date. Haven’t signed up for Project 52: Date Nights? You can join any time by signing the Project 52: Date Nights Pledge. Then come back each Tuesday to tell me about your date. Tiffany, this is a super great idea! : ) Definitely going to have to try this one. Our first of 52 dates was to get out of the house after being couped in (me) for a whole week with snow We went to eat and to see Blindside. It was awesome! It takes 45 minutes to go to the movie theatre so that is a lot of time to spend talking. It was a wonderful date. Now to get more creative with an at home date! Great idea! I’m so excited that you are doing this. Before I stumbled onto your blog, I was planning out our date nights! Because of cost and having a 2 yr old and a 6 month old, we are doing 3 dates in and one out. Our date night is every Thursday. Week 1: Coffee house — read a book out loud together and drink coffee! Week 2: ABC Dates — Alphabetical dates, A starts on Thursday! We’re going to Atlanta Bread Company, then play Air Hockey, and make a trip to AC Moore to look at Art supplies! Week 4: World traveler- pick a country “plan” a trip there, eat that cuisine for dinner! We are so excited about the special time we’ll share! Thanks for this word game, we’ll play it at Atlanta Bread Co. on Thursday! You’re ideas are great! What a cute idea. I’m going to print this off and hold onto it. Dave and I have some quiet nights where we can do something like this and just relax with one another. In fact, last night he ran me a bubble bath, a drink and some dark chocolate. It was wonderful! I loved it! This little game will be a great addition to our “quiet time”. I really love Nikki’s ideas about the ABC date nights. That is totally cool! I’ll have to give Dave that idea tonight! What a fab idea. The Man and I will have to try it too. 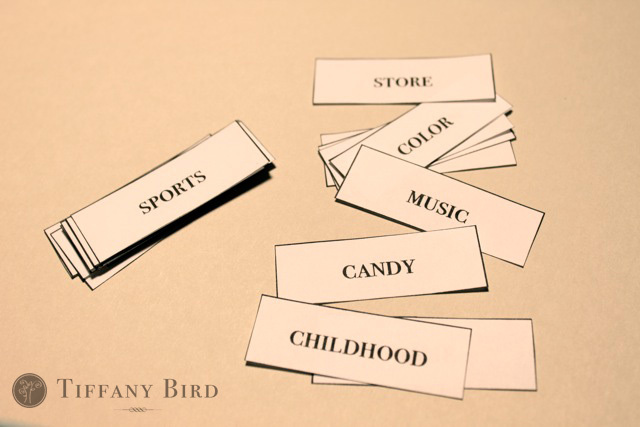 I love this word game, and being a writer…I love words! I look forward to playing this one, and your handy print sheet is so convenient. Great idea! If you want ABC Date ideas – visit our blog where we spent the better part of 2009 exploring each letter once a week. There’s lots of ideas to get you going. Simply click on the “Alphabet Dates” category link. See ya next week! I LOVE this! I put it to use when I planned our first date night which was a recreation of our early dating experiences. I tweaked the rules so that they were that what he and I shared were first memories of one another associated with that word. I think that this game single handedly took our emotional intimacy from a solid 8 to a 10. Thank You!!! I am wanting to do this for my hubby for Christmas, but I can’t get the pdf for the pledge, would you rather game, or first words to come up. Any chance you’d be able to email them to me?